Flex your fingers and warm up your wildest gestures with six decks made to enliven the living room. Flex your fingers and warm up your wildest gestures--this classic game's about to get more interesting with six entertaining decks for controlling the content of charadathons. Designed with separate decks that cater to different age groups, you're sure to find the perfect mix for the whole family--from your feisty four-year old to your talkative 12-year old, and beyond. 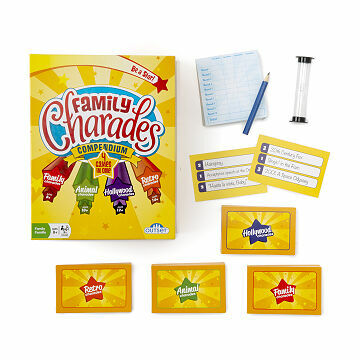 An exciting, family game for camping trips, long holidays or after-dinner fun, this set is sure to bring laughs for charades to come. Choose from Picture, Kids, Family, Hollywood, Animal Party, and Time Capsule categories. Made in China. Includes 3 sand timers (30, 60 and 90 seconds), jumbo die, pencil, score pad, and set of instructions with all the hand symbols you could possibly need! Looking forward to having fun with the family!The product arrived on time. This was a Christmas gift for my 13 year-old niece. She loved it! We immediately started playing it as a family and it was so much fun. The words are challenging too. Love that it has different Charade games within one box. You can tailor the game to your audience. We had purchased this for my brother and his family and they loved it, so I bought it this year as a gift to my kids(ages 13,9 & 3). We have had so much fun playing this! We adjusted rules slightly for the little ones, but it has been a blast! Kids love it! It will be enjoyed at adult game nights as well, works well for all ages! We had hours of fun playing charades. It worked for a variety of ages too so the entire family could join in! Haven't opened the box yet but it looks like lots of fun. We typically write down our own charades phrases but it is fun once in a while to not have to think about it. Just open the box, choose a subject and the fun begans!